We held a shootout here a few days ago – $85K Audio Note Ongaku versus $22K Lamm ML1.1 versus $10K Audio Aero Capitole versus $9K Audio Note Conquest Silver. Prices rounded, so don’t quote me to Neli :-). The Audio Aero Prestige as serving as CD / SACD player, and sometimes as linestage as well. The Audio Note AN/E Signature loudspekaers were serving as… speakers. 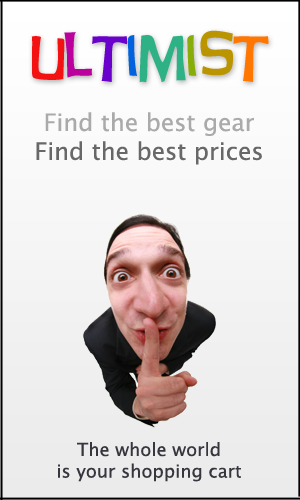 So, with the disparity in pricing – it wasn’t really a shootout. More an investigation into different sounds – how the different amps sounded, given that they are indeed so very different from each other. We finished up with the Audio Note Conquest Silver 300B amps. We will try to describe the *differences* between the sounds, as opposed to the sounds themselves. Going from the Audio Note U.K. Ongaku to the Lamm ML1.1. The Ongaku and ML1.1 amps resting behind the couch after their workout during the shootout. The sound was not as big with the Lamm, somewhat more compressed – but perhaps more even-handed because the somewhat rolled-off deep bass [which lends the deep bass a compression-like signature], because of where the speakers were located [in front of the horns, which are out of here as soon as the snow melts. If it melts.]. The Lamm sound was more laid back, the soundstage receeding somewhat, which allows one to better appreciate the music in measured doses when desired, as opposed to being transfixed unable to move for whole CDs at a time [from this description I hope people see that we like both types of soundstaging – really depends on our mood at the time]. The Lamm harmonic color was a little grayer, and the dynamics, as mentioned above, a little less exuberant. This goes in keeping with our general interpretation of the Lamm sound as being stately and sophisticated, natural and self-consistant. This is not to say that the Ongaku is an exuberant amp either – it is actually quite balanced, unexpectedly so from my point of view, with just a little flavor from the use of the 211 tube. We still have a lot to learn about Audio Note, but it is my current impression that as you move up in the Audio Note line, things become less colored and more accurate and therefore much more revealing of the color and subtleties of the music itself, quite unlike anything else out there. This seems different to me from the brands that, as you go up their line, you get more and more improved versions of their ‘house sound’. ‘Course, you can always tube roll the amp and get just about any sound you want – but I think the point has been made. The Capitole was sweet in comparison with the ML1.1. More euphonic, rounder, less resolution and transparency. For some reason, about half of the people we talk to these days are conscously steering away from high-resolution sound – so this amp, with ‘just enough’ resolution, should really be on everyone’s short list. No one really knows about it, but, especially teemed with the Capitole or Prestige CD player, you can get a really wonderful, Enjoyable and slightly Sweet, sound. 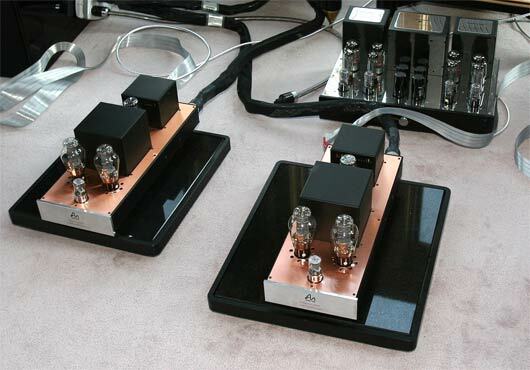 The Audio Note Conquest Silver amps in play. 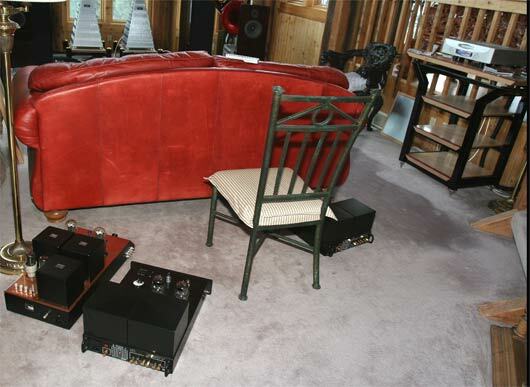 The Audio Aero Capitole amp behind, resting. Easiest to compare these to the Ongaku. Less density. By which we mean less resolution, less micro-dynamics, less macro-dynamics, less color. Just less going on. But at the same time, note by note, it was the same: the notes were where they were supposed to be, the rose and fell like they are supposed to, they were just a little thinner sounding. OK, a lot thinner sounding. Thinner sounding isn’t exactly ‘bad’, though, There is a lightness to the music, very similar to the experience of the $11K Kharma 3.1c versus the $45K Kharma Mini Exquisite, which I think is largely a psychological, not electro-mechanical, experience that is quite pleasant and refreshing. That sometimes a ‘lighter fare’ is as enjoyable, to a listener, as the full-featured experience. Kind of like comparing the Simpsons [the old shows which had content] with a James Bond movie. One can enjoy both. But one generally prefers, and will actually pay more money for, the Bond movie. Hey Mike, could you please try to explain the expected upgrade , soundwise, as you go up the Audio Note line? I mean, the pre-amps are quite easily followed(M1,2,3…) but the amps and speakers are a mess. Dagogo reviewed thousands(!) of them and i still can´t figure out which is which, what they do diferently etc.. This shootout was really nice . I’ve actually started work on an article which will make explain the Levels system, how it is applied, and what progression takes place, both in general and in particular for each product area. It will be posted on TriodeandCo.US and will be accessible either through Philosphy or Downloads. I hope to have it done and posted by early next week. Hi Triode, that is great news,thanks a lot, i´ll sure look it up. There is no AN dealer in Brasil, (though PQ told me it will be fixed soon)and this work will help a lot.